Some of our favourite products combined into one package! Make the most out of your 16oz glass mason mugs - either use them for your favourite drinks or give them as gifts! Why choose Jervis & George? Safety is our priority and this is why we regularly perform external safety tests on our products to ensure they are 100% safe. At J&G we are all about sustainable, innovative and safe products. We want to ensure we are eating and drinking from quality natural materials that are safer for us and our planet. As well as being easier to clean than plastic, glass is safer as its non-porous surface doesn't absorb food and germs. The glossy surface of glass repels food odors and residual flavors which not only makes it safer but also makes the food and drinks taste fresher and fuller. Buy our products completely risk free and if you don't love them for any reason then they can be returned for a refund. 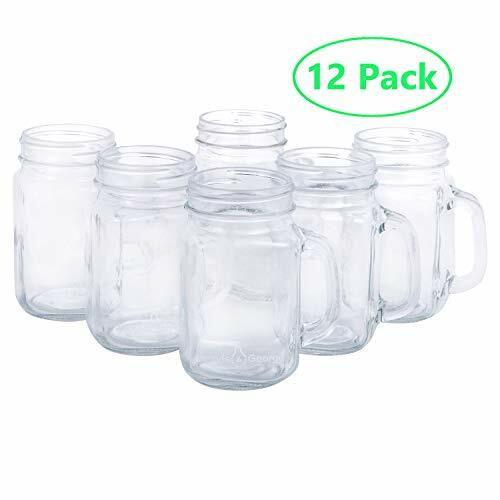 COMPLETE PACK: 12 * 16oz Mason Glass Mugs - use for party drinks, gifts + more. MULTI-PURPOSE: Great for gift ideas and perfect for serving beer, soda, cocktails plus more. NON POROUS: These are GLASS jars - glass is safer as its non-porous surface doesn't absorb food and germs. Glass repels food odors which makes food and drinks taste fresher and fuller. WHY J&G: We are all about our food and drinks being stored and served from safe, non-absorbent materials which are innovative & ECO friendly. Our products complete safety tests to ensure they are 100% safe and have no nasty toxins. We also offer a lifetime guarantee - if you don't like our products then simply return them for a full refund. If you have any questions about this product by Jervis & George, contact us by completing and submitting the form below. If you are looking for a specif part number, please include it with your message.